A return visit to the Bridge by the Ant Law Quartet. 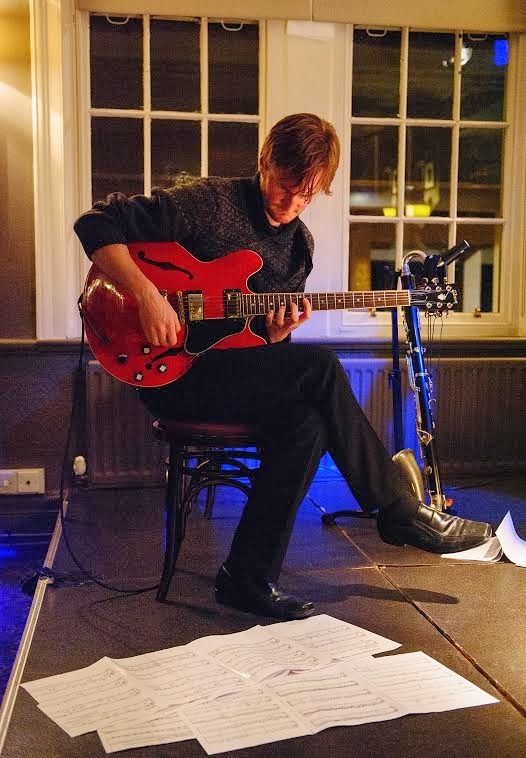 In 2013 guitarist Ant Law’s Newcastle debut made a big impression and with the same line-up of the best of British new wave jazz talent on show this was an eagerly anticipated return gig. This Splinter at the Bridge gig, in association with Jazz North East, attracted the regular first name punters. Sporting a beautiful Gibson (335? ), Law chose to play seated, by no means adopting a front man persona. His band mates contributed in equal measure. Reeds man Michael Chillingworth switched frequently between alto sax (Conn Underslung), clarinet and bass clarinet, alto perhaps his most effective instrument. 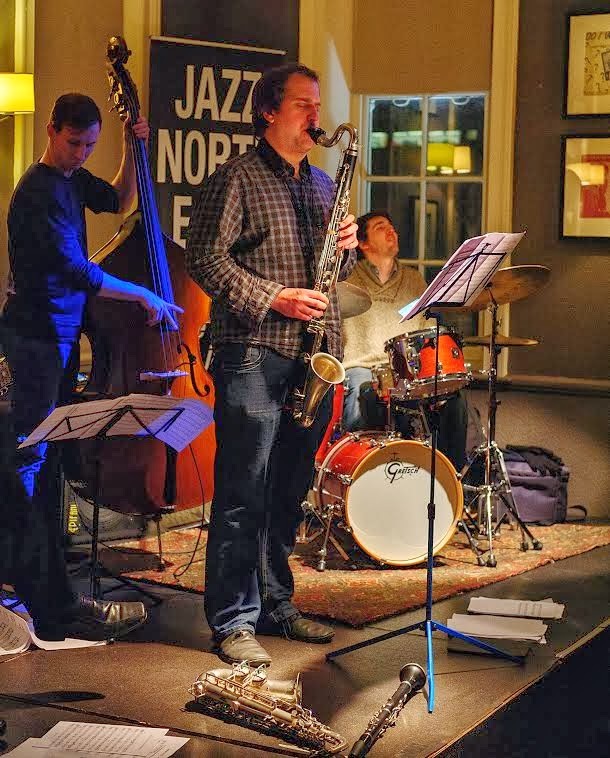 In demand bassist Tom Farmer, another undemonstrative type, anchored the quartet with a swing time feel in his back pocket and drummer James Maddren could work eight nights a week so in demand are his services. The first set had a reserved if not downbeat feel. The playing immaculate, the fireworks were kept under lock and key. The intricate interplay mesmerised; big Tal Farlow-like chord stretches, locked-on unison lines between Law and Chillingworth under the watchful eye of Farmer and the ever responsive Maddren. Second set, things opened up a little. Triviaphobia took flight; a perfectly conceived guitar solo, reeds likewise and the rhythm makers – Farmer and Maddren – nailed on. 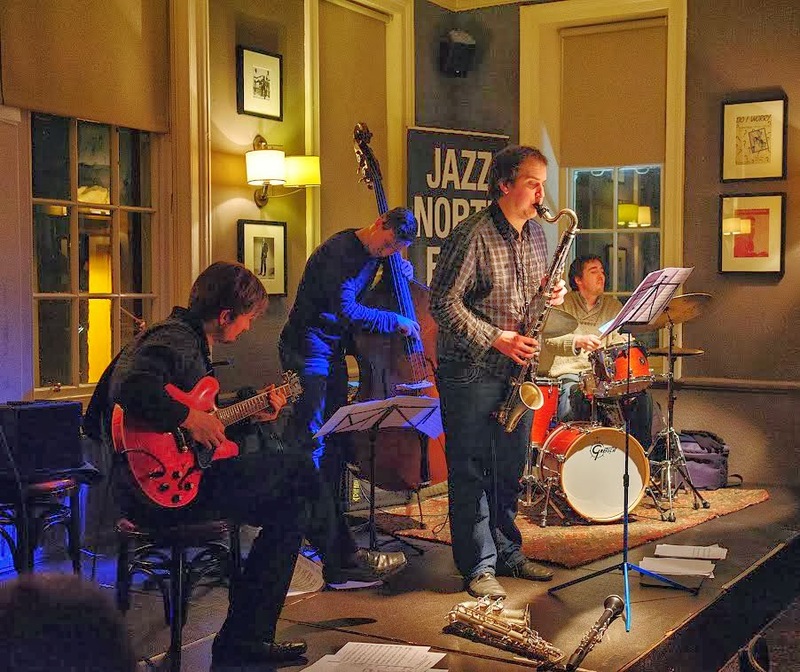 Two compositions, back to back, formed the centerpiece of the evening, the latter – Parallel People – heard all four musicians pushing it to the limit. The Ant Law Quartet should be heard by all and sundry. If you weren’t at the Bridge Hotel then get to the Lit and Phil pronto. The guys are there this Monday lunchtime (Monday February 3), 1:10 pm start, £4.00. at the door. Highly recommended. What brilliant photos on this post. I think this gives the 'feel' of the gig, even though I wasn't there, I was at a folk club at the time I must confess.